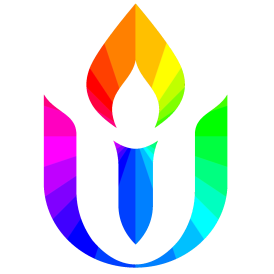 Our mission is to be a caring community that encourages spiritual growth and actively works to improve our society and the environment. 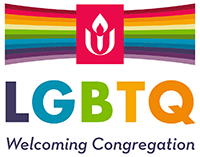 We are an LGBTQ Welcoming Congregation. Everyone is welcome, no matter what you believe, which gender you are, or who you love. Our congregation celebrates diversity and affirms each individual’s worth and dignity. The main service is at 11:00 a.m. Central Time. There is also a Contemplative Service at 9:00 a.m. and a Meditation Service and an Adult Forum at 10:00 a.m. Check the Current Newsletter for the topics and speakers. Childcare is provided from 10:30 a.m. to 12:15 p.m., and Religious Exploration Classes for youth run from 11:15 to 12:15. 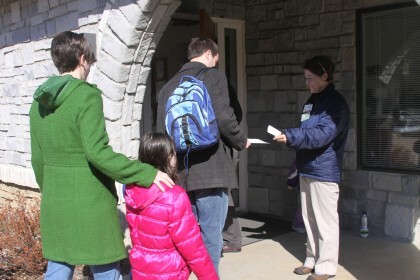 We have three teachers on staff, and members of the congregation assist in the classes. Please REGISTER your children for classes. Come dressed as you’re comfortable! Business casual, jeans. Summer shorts and T-shirts, winter sweaters and boots. Children should wear comfortable clothes, as there are a variety of activities for children, which may include playing with art supplies or going outside. Parking is available to the side of the building and behind the building. There are parking spaces reserved for visitors and for the handicapped. Our buildings are wheelchair accessible. Following the Service, everyone is invited to stay for refreshments and conversation in the Social Hall, next to the main building. On the last Sunday of the month, there is a potluck lunch, and everyone is encouraged to bring a dish to share. All are welcome! Please come!